Handicap people nowadays are no longer those weak fragile people who need someone support to live on. Hiring disabled workers shouldn’t be overlooked by modern enterprises. They have their own self-esteem and pride. So, therefore, handicap people are willing to work on their own, get their salary and take care of themselves as well as their families. But there are companies which aren’t willing to hire people with disabilities because of the fear of the employers that the person can’t fully perform their work and hence the company will get into trouble. It’s not always correct to judge people just by their appearance. Every coin has two sides. It’s not good to jump to conclusions. 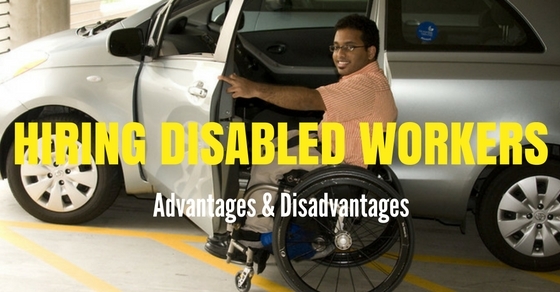 Here are a few advantages and disadvantages of hiring disabled workers. These ideas help you to have a clear view of both the sides. The following mentioned are few benefits of employing disabled workers. The companies who want their tax burden to loosen a little can employ disabled person so that they can have many tax benefits which are only given to those companies who have major or any number of handicap employees. The cost of preparing ramps or having a barrier-free environment is reduced by the government to encourage companies to hire a handicapped employee and also helps the handicapped people to have a better access to the area around them. Many companies hesitate before taking them in but after having this kind of facilities or having a person with good qualifications even if he’s disabled is not that of a bad option. You can think and sure something good will out of it. Government organization in many countries provide funds for recruiting disabled workers on a small scale business in order to increase employment opportunity for the handicapped people. Therefore, employers can take advantage of such opportunities to reduce the financial load of the company and increase ways of gathering funding for small business. Government funds vary from direct tax reduction on the salary to subsidies on making infrastructure and creating facilities for disabled people. You can always have many good workers no matter if your company is a big one or a small one. But the disabled persons are very hardworking people because they have reached such a capable level that they can do a work on their own. So, of course, it’s not hard to guess how much work they had to do to reach this level. We all know that the disabled people need to do more work to better their level at something than the normal people. So if you are hiring a good professional person then it will pay you off. You won’t regret having a good hard working employee setting aside the problems. By recruiting disabled workers, a company will be having another large set of the population who, though may not be normal in all aspects but can prove to be equally talented when it comes to the job requirement. Infact, many independent studies have shown that given equal opportunities, disabled people can perform on par with normal people. So, companies should make an investment in recruiting disabled people. Recruiting disabled workers can immensely increase the image value of the company. It will boost the goodwill of the company and it will create a positive mindset in the society. Although, that does not mean that the company should start to select such workers only for image sale. The selection, nevertheless, should be based on the eligibility criteria of the job. But, the job opportunity should be equally available to all kinds of people. This will prove to be highly useful for the company’s assets as it can increase positive feeling about the company among workers and outside people. Including disabled people in your workforce gives an extra edge to your case and gives an advantage in any cases related to discrimination. Plus, the added social support towards your company helps to gather a good support towards your cause. If you treat your disabled employees as you treat any other worker, then it will help in taking help of various acts and legal documents to prevent any legal problems from arising and in addition, ripe some extra rewards the government has to offer. Many employers think that just because some people behave in a special way means that they cannot be entrusted with jobs or works. But, many independent research works have shown that handicapped persons can be trusted more on confidential matters and that they do serve up to the expectation of the manager. They are hard working and very loyal in every matter. They try to give their best at anything. Diversity is the key to success in today’s industry. Diverse workforce ensures that you have a talented pool of workers that will be able to handle workloads of various types and intensity at any point in time. And, disabled workers provide a different type of diversity in the workplace which is the unique ability in both physical and mental ways. Although they may lack in their physical abilities, most of the mentally sound handicapped make up for it with certain extremely mental abilities which others can only think about. Many of the disabled workers are found out to be more loyal than their normal counterparts. Despite, many twisted opinions that many managers might be having about these people, researchers have shown that disabled worker is loyal to their bosses and have more probability of meeting the deadline than their other counterparts. They are true in their opinions and are very focused on their work only. From various statistics citation, it has been found that handicapped workers are usually subject to lower turnover rate and they prefer to do their job efficiently without much of complaint from their higher authority. Handicapped people, being loyal in nature, prefer to stay in their current job and they are less likely to change their position, post or job on a frequent basis. Not only are these fellow guys loyal and focused, but they even take fewer holidays or unprepared leaves from their office. This can help small entities run flawlessly where the presence of each person on every working day counts. In addition, it also helps the company to save additional money on paid-leave which, they would otherwise have to bear for the normal counterparts. In a survey, it is proven that the physically challenged people take less sick leave than any normal average employee. This will always be beneficial for any organization. There may be many benefits to having a disabled worker under your supervision, but there are some problems too by working with disabled persons. Some of them are mentioned below. Sometimes the speed of working with the disabled person is comparatively low than the people with no disability. As their handicap restricts their movement which results in the slow pace of work. What a normal person can do faster, the disabled one takes comparatively more time than that. So, of course, it hinders the important chores of the organization. That is why people think twice before hiring a disabled person. Even if we are in a modern era but still some of the people will hesitate before working with a disabled person as they won’t like many things about them. Many employees don’t like to work in a team with a disabled person hence slowing down the project. These are people’s thinking, it’s not that easy to change it after all. Many people also think that as they are physically challenged they are more often to be absent than the normal person. Many also think that as they are provided with special amenities then they use it in a wrong way or don’t work hard as they are on the safe side. But that is not true. This kind of disbelievers leads to many problems inside the office. As there are somethings a handicap cannot do so they have to be provided with a caretaker at some point in time and the whole infrastructure must be little different than the rest of the buildings. A building which supports the movement of a disabled person. Like a ramp has to be provided. Even if it’s there but still the person would take much time to do it rather than a normal person. There must be special amenities which can help them to do certain works. So the company should also provide that. If they can’t then there are no other ways to do things faster in their case and one has to accept that. Another employee must also adjust to some things in the office for the comfortability of the fellow handicap worker. All the companies hiring disabled people sometimes don’t understand the need for good infrastructure for these people which leads to problems for them later on. For this reason, only, many physically challenged people are not chosen because they can’t afford the changes in the building. By having a look at all these points we can easily know that hiring a good person no matter what the disability will always be beneficial. Losing a potential worker just because of some problems won’t be a good idea. Believing in various prejudices and disbelieving the ability of a person is a wrong way of doing things. No matter what, one should never judge a book by its cover. The disabled people are more enthusiastic and passionate about their work as their only goal is to get recognized by the other people. They don’t want to discriminate and be separated and treated differently than others. They are humans as well so of course, they would love to have the same kind of generosity we give to others. Many people at work have a bad habit of staring at a little different or challenged people. It’s quite normal they won’t like this kind of feeling. Everyone has some honor and they like to protect it. Have a good talk with them, consider them your friend then only they will feel comfortable around you. The disadvantages are not that hard to overcome but the advantages are many. Just because the person is physically challenged doesn’t make him/her less talented. Talent has nothing to do with disability. There are many examples of those people who have worked very hard to overcome their disability. If the person sitting before you has overcome his/her disability then it is sure that they can take your company to a different level of success. Every company needs these people who are willing to change fate according to their liking. A company must never lose opportunities to grab a talented employee as they can do very good in their field. Yes, there will be some problems but losing such people for such reasons doesn’t seem correct. Always believe in the people’s hard work as it is the only thing which may help you later on. Maybe the disabled person can delay some work due to their disability but a good worker will always work ahead of time to counteract this problem. The company must also provide good facilities which are accessible by the physically challenged workers. This will show them how concerned you are for them which will make them happy and they will be willing to work even harder then. They are very faithful and the obedient person so makes sure to help them and get more and more paid off by their hard work and loyalty. Respect the disabled workers and get respect in return. If you are willing to take a good and qualified one in your company, you won’t regret it.